So tonight was the Selah/Avalon concert at my church. If you don't know who they are - they are two awesome, extremely talented Christian groups. Check them out on itunes. But the highlight for me was I got to meet Angie Smith. Her husband is the lead singer for Selah and she writes a little blog I'm pretty sure every one of you read. I started reading her blog around the time she started it and we have talked many times and she has just been such a source of encouragement and faithfulness to me. I adore her. As I know most of you do too! I was so tickled when I found out they were going to be coming to my church and even more so when she said she would come along! She is prettier in person than she even is on her blog and sweeter. She just felt like an old friend. I loved meeting her girls (you can see Kate above). Kate even sat on my lap half the concert when Harper was being held by her grandmother. I was so nervous about taking Harper and figured she would be AWFUL or she would be great and she was SOOOOO good. She loved the music and lights. She never even slept (which considering the fact her bedtime is around 6:30/7 and we got home after 10 is amazing!) Actually the only time she cried is when Todd (Angie's husband) came by and said hi and gave me a hug - she just squawked. Maybe she doesn't like bald men? ha! :-) It made me sad as I held Harper sitting next to Angie and I was wishing she was holding Audrey too. I can't imagine how much she must miss her. But God has given her such an amazing testimony and such a strong faith - I am thankful for someone like her who is so caring and willing to share what Jesus means to her. What a blessing to know such a Godly woman of faith! P.S. I'll have the Show Us Your Life - TAILGATE/TEAM post up sometime mid morning so get your posts ready!!! I just had to share about meeting a special blog friend! that's so neat! (glad a tornado didn't hit while you were in there!!) i got to meet several bloggers at the typeamom convention (and i've met your mom) and it is such a neat wonderful thing. i am so blessed by the people i've met through blogging. Sounds wonderful, Kelly! You and Angie are both beautiful...inside and out! What a gift to get to meet face to face. How fun! So happy you got to meet her. Two of my favorite music groups, wish I could have been there. That is super awesome!! She seems like such an awesome women!!! That is wonderful! I think I started reading your blog because Angie shared on her blog that we needed to pray for you and Harper. I have been reading your blog ever since! So glad you could meet. So wonderful to meet you as well! I am also glad we had a chance to pray together! Thank you! I'm so jealous that you got to meet Angie! She's such a special person! And she got to meet you! A double blessing! These are such comforting words that paint such an amazing picture. Praying! How cool is that? You just know God had you in mind when he picked your church to be the concert venue! And you got to have Kate sit on your lap- you must be special! Is she as spunky as Angie describes? That color looks lovely on you! And I really like the bangs. How cool that you got to meet her!! Her blog is so inspirational and well . . . just real! (like yours) Glad you had such a great night!! I get the same feeling being pregnant when I'm around my friends who are still experiencing infertility. I feel so guilty for being so blessed (yes I do realize I am silly one told me so) while they continue to go through so much uncertainty and so much pain. That is so awesome you got to see Selah in concert and meet Angie and Todd!!! How exciting! I love it when you get to meet fellow bloggers and post pictures. I bet the concert was awesome, too...! You girls look beautiful in your pictures. I bet she was just as thrilled to meet you. i love meeting fellow bloggers! meeting Angie would be over the top though! so happy for you! SO COOL! It is so neat to see my two favortie bloggers in one pic :). I can imagine as you said she is even prettier and sweeter in person, she seems SO awesome! Deff. jealous too you got to see Selah and Avalon, such AWESOME talent :o). I don't even have the words to tell you how HAPPY I am that you were FINALLY able to meet Ang in person. :) What a BLESSING! My prayer is that one day I'll get to OFFICIALLY meet both you...and Miss Harper, of course! So glad you had such a wonderful time. There is nothing like being able to worship in a room full of, and with, amazing people! So fun! Y'all are so cute! Wow that is amazing!! I would love to see Selah and Avalon and would be giddy to meet Angie!! Sounds like an amazing night! Glad Harper enjoyed it too!! How F U N! Y'all look so pretty! Two of my FAVORITE blog woman spreading the LOVE of God. Love it! Yall look so pretty!! I should have put two and two together...that is so fabulous that you got to meet Angie. What an awesome experience! So glad you got to meet Angie!She is one of the sweetest,most beautiful people in this world.My husband and I are what you might call Selah groupies.Any time there is a concert within a 3-4 hour radius,we are there.I have actually been at two concerts when Angie was there.The first time I met her I cried.You were right on when you said it is liking meeting an old friend.We are going to a Selah/Avalon concert next month.I can't wait! How awesome that you got to meet her!!!! I just met a blog friend, SHannon, a few months ago and we have become the BEST of friends!!!! Awesome photos! I sooooo hope we find a church here that we love soon. How fun to meet her! I am glad Harper was great and you where able to enjoy the show! That is so fun! I am so glad yall got to meet. And i am so glad Harper was good! She is a trooper! Hey Kelly! Remember me...I won the Selah CD in your giveaway. I am so jealous you got to meet Angie and hear Selah. They were scheduled to be at TBN October 6th in Hendersonville, but were not there. I SO bummed. But Jason Crabb and Phil Stacey made up for it! Praise The Lord will air tonight on TBN. Hope you can watch it. Have a great weekend. I cant believe you got to hang out with Angie! Awesome! I love Avalon. Michael Passons (previous member of avalon) goes to my church here in Nashville and leads our services when our music minister is away. He's great! So I got to meet Kelly last night at this same concert! :O) My boyfriend was laughing so hard at me because I was sitting behind Angie and Kelly by a few rows and just was SO excited for their meeting. He's like "how do you know these people?" What a fun concert and fun night. I'm one of the single girls on the prayer list and I got to tell Kelly in person how much I appreciate all the prayer and encouragement we receive through her blog. Now if I can only remember to bring my camera along to these things!! How pretty are y'all? What a fun night! So thankful you two finally were able to meet. I'm sure it was a most memorable evening. Hope to meet them one day and would love to see one of their concerts as well. That is so neat that Angie was there. How cool it was that you got to meet her (I lover her blog). I had wanted to go to the concert last night, but my older kids have other obligations on Thursday nights so I couldn't. Oh yeah, GO HOGS!!!! that is so great that you got to meet her in person. 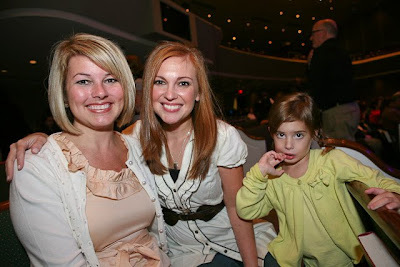 Angie's blog is great and I love Selah! I saw Selah in concert at a local church last year and was so disappointed that Angie didn't come along! haha! So jealous you got to meet her! Have not checked in for a while...life has been catching up with me...but I just have to say the blog looks great!! I'm so glad I've got some bumps in my 'road' smoothed out so that I can go back to checking in on all my bloggy 'friends'. God Bless!! I'm trying so hard not to be jealous!!! How amazing and so incredibly special that you two got to meet :) Two very special bloggers in one room, wish we all could have been there!! I love this post! I love that you always think of everyone else! (like thinking of how Angie must feel because you have Harper in your arms and she doesn't have Audrey)And I love it that it was pouring rain! (because Angie mentions on her blog often that any time they are doing something that has to do with Audrey it rains. Not only was it raining in NWA last night...it was pouring! )Audrey may not have been in Angie's arms last night, but she was there! I just wanted to tell you that I love love love your blog! And that we dealt with infertility for 6 years before God brought us our beautiful daughter Josie Kathryn through our state's foster care system. We are now on our way to adopt our next baby girl and are naming her Harper Arizona! I just thought it was such an original name and found it hilarious when I found your blog and that was your daughters name! Congrats on your beautiful blessing. Isn't God amazing? 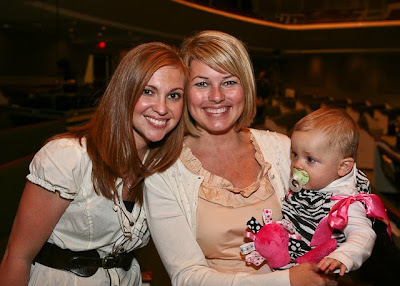 Your blog and Angie's blog are two of my favorites: the worlds collide! I'm so glad you got to have a fun evening with her. I think I may have found your blog from a post on Angie's asking for prayer for you. God is so good to us all.